Sunrise at the Grand Canyon...another check-off on the bucket list. We got up at 5:00am for the drive to the Grand Canyon to watch the sunrise. We were amazed to see a line of cars at the entrance gate when we arrived. Simply put, the sunrise was beautiful. Even with all the people, it was so quiet and peaceful...we were in church...we were in awe of this place. Couldn't help but look up and praise God. The sunrise show slips by quickly, the colors in every direction change by the minutes. 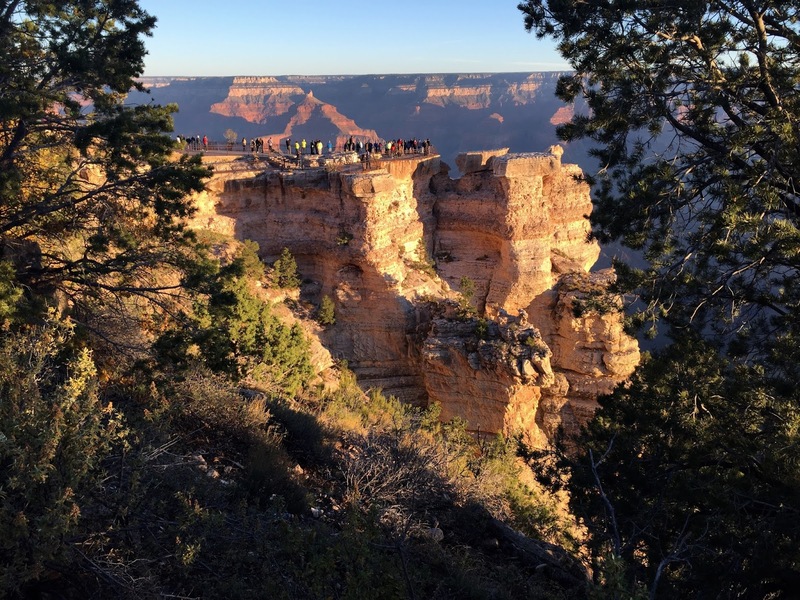 Mather Point, a popular overlook at the visitors center. People were perched on every view point that was accessible. 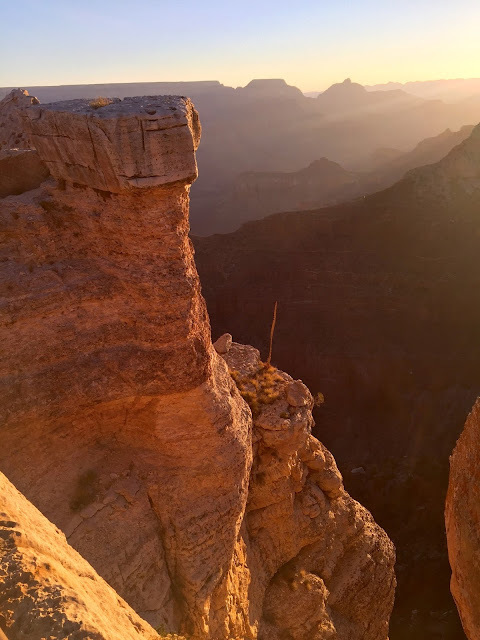 After sunrise we started our hike into the Canyon on the South Kaibab Trail, our destination being Skeleton Point. Above is a pit toilet at Cedar Point about 1.5 miles down from the rim. 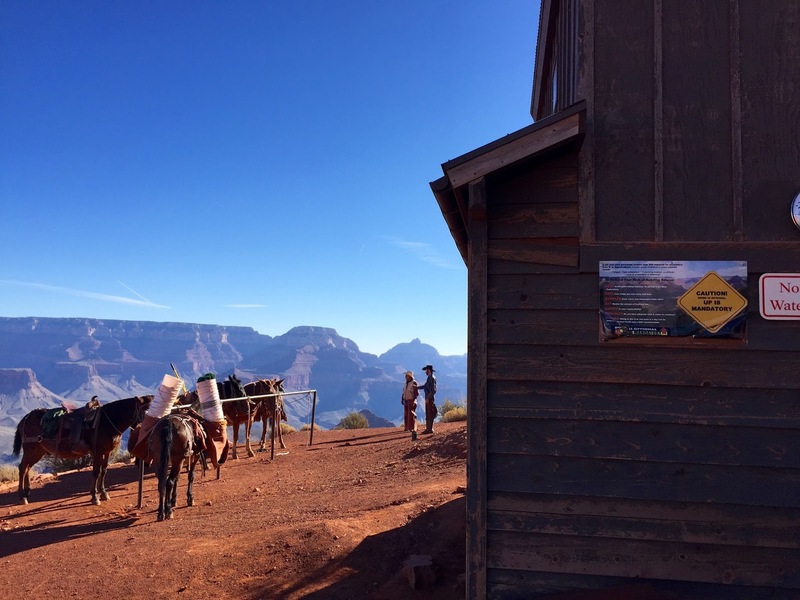 The cowboys did some cleaning and maintenance checks, the toilets are composting using solar power and other creative practices. (Much better than my initial thought of having to haul the "stuff" out.) One mule was loaded with several white buckets, not sure what they were used for? 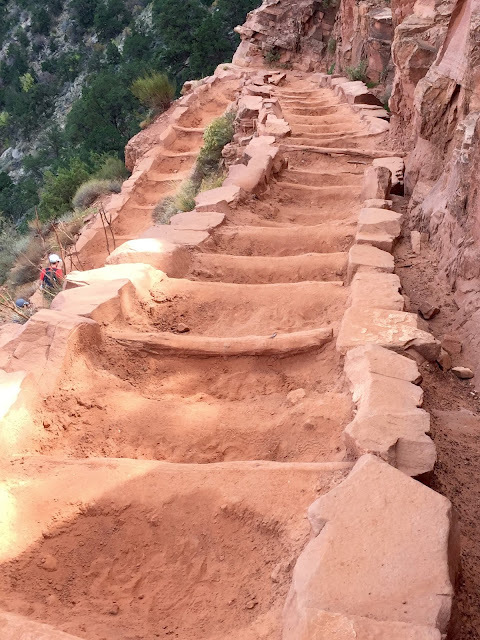 There weren't many open spots on the trail, most of the trail is narrow with rock walls on the inner side and a drop off on the canyon side. It's a beautiful trail, very scenic in all directions. We chose this trail over the more popular Bright Angel trail because it is less traveled and used by the mule trains. We had lunch at Skeleton Point, the views amazing with our first view of the Colorado River at the bottom. 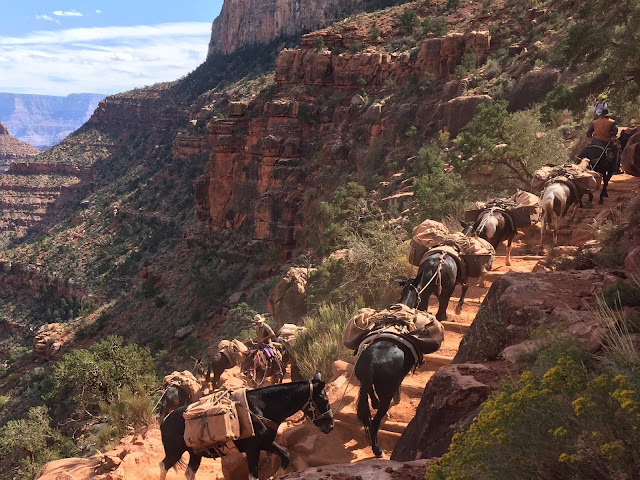 Mule trains haul supplies to Phantom Ranch at the bottom of the Grand Canyon. 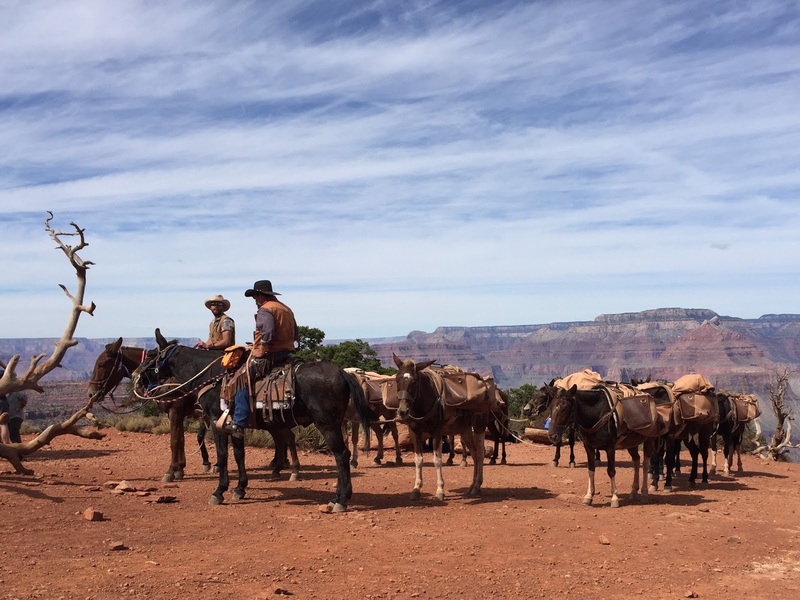 There is also a service that hauls overnight hikers gear into the canyon. There is a $70.00 fee per backpack each way, the weight limit being 30lbs. 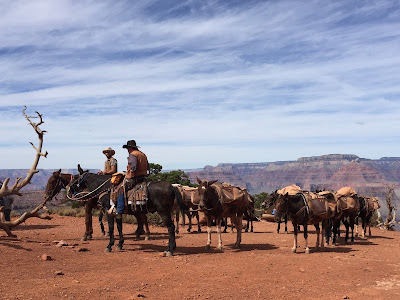 We were thrilled to meet the mule trains. Mule train takes a short rest at Cedar Point. If there's a negative about this trail, it's the trail. 3 miles, but many stretches are very rutted with uneven steps, the ruts are from all the mule traffic. Instead of looking about at the views, one had to look down and watch where your feet were landing. Funny thing...I didn't notice all the steep switchbacks going down. A 7 mile hike... another challenging trek completed, so worth it!